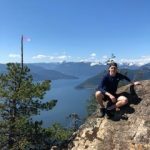 I am a research assistant from Winnipeg Manitoba who just finished the third year of a degree in Natural Resources Conservation at UBC. Growing up I went to the family cabin in the Lake of the Woods region of Northwest Ontario. This helped to develop a love of forest landscapes. Learning about tree rings from my father was a major influence into why I decided to apply for this job. Now, using specialized software I can analyze and understand tree rings far better than 10 year old me had imagined. Throughout the middle of the summer I will be in the field collecting samples to be analyzed thusly. Upon completing my degree I plan to pursue a law degree, however the experience garnered from this job will be invaluable.